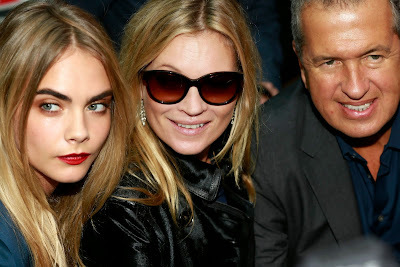 LUXE Models Blog: Are the Worlds of Fashion and the Music about to Collide? Are the Worlds of Fashion and the Music about to Collide? A somewhat far-fetched story recently reported in the Daily Star has made Luxe Models wonder whether the worlds of fashion and music are about to collide in a way we never could have imagined. As much as it sometimes pains us to admit it, The X Factor has changed the face of modern music. The Simon Cowell creation has further commercialised an industry that we didn’t think could possibly be commercialised any further than it already had been after its bubble-gum pop days in the late 1990’s. One of the reasons The X Factor has been such a hit is that it turns the relationship between its judges into a circus. We all remember the Sharon vs. Danni, the Cheryl vs. Danni, the Cheryl vs. Mel B, the Sharon vs. Louis and the Simon vs. everyone sagas. Shows like The X Factor are more likely to make stars out of their judges than the people who actually use them as a launch pad into the world of showbiz. But it’s a symbiotic relationship. The show relies on the star power of its judges just as much as those who man its panel rely on its power to turn them into stars. That’s why every time The X Factor hits its latest ratings slump, the show’s execs decide that it’s time to shake up the judging panel. The X Factor was pounded in the ratings last year. So now every tabloid across the UK is speculating who’ll be added to the show’s judging panel for its next run. A lot of names have been thrown into the ring so far (as usual), including Nick Grimshaw and Rita Ora. The most surprising name is Kate Moss, who has been touted as an assistant judge that could help Grimshaw at the judge’s houses stage of the competition. Let Luxe Models tell you why this is a really bad idea. We adore Kate Moss. She is arguably the most famous super model the world has ever known, and she’s sparked more fashion trends than Madonna, Anna Wintour and Jackie Kennedy combined. Yet she isn’t a music industry professional. She has no experience in this field and would be a disaster of a judge. If you don’t believe us, why don’t you look at a similar shock Simon Cowell hire; Ellen DeGeneres as a judge for American Idol. It generated a tonne of press but once she started the job it quickly became obvious that she had no idea what she was doing. Needless to say, she didn’t return the next season. OK this isn’t quite the same thing but the point stands. There are many amazing ways that fashion and music have collided to create something incredibly beautiful. We don’t believe that hiring Kate Moss to judge the public’s singing ability would be one of them. Like DeGeneres time on Idol, it’d be nothing more than a publicity stunt. Labels: blog, fashion, Luxe Models, music, news, X factor.